Rudrakshas are commonly associated with Shiva worship and hence important references of the bead appear in texts that are dedicated to Lord Shiva. Rudraksha Jabalopanishad, from the Sama Veda and one among the 108 Upanishads, deals extensively with the benefits and worship of Rudraksha. The Padma Purana states that the Rudraksha showers its benefit on an atheist and a devotee without any discrimination. Chandrajnana, a Shaiva Agama, states that Rudrakshas that are of copper color, hard and big with intricate designs are of special value. Those Rudrakshas without a proper shape, broken lines, worm inflicted and broken should not be used. 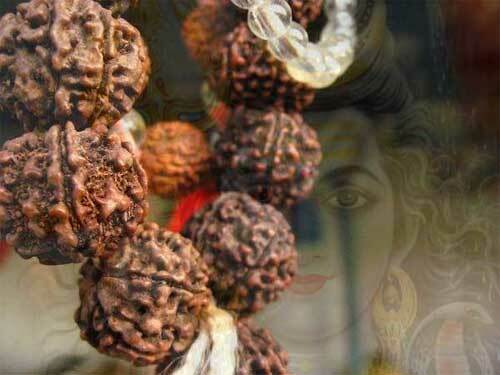 Meru Tantra, a Shaiva text, states that the power of a Rudraksha bead increases with its size. Rudraksha Jabalopanishad details about the benefits attributed to different Rudraksha faces. Single-Faced: It is the form of the Supreme Truth (Brahman) and helps in realizing the supreme truth. Two-faced: It is the form of Ardhanarisvara and helps in good living on earth with one’s partner. Three-faced: It represents Agni (some suggest it represents Trimurti). Four-faced: It represents Brahma and helps in all-round development. Five-faced: It represents Panchabrahman (five-faced Shiva) or Kalagni Rudra and helps in overcoming sins committed. Six-faced: It represents sons of Shiva – Kartikeya and Ganesh – and those wearing the bead attain wisdom and wealth. Seven-faced: It represents Seven Matras and a devotee attains health and purity of mind. Eight-faced: It represents eight-fold nature (five elements and mind, matter and ego). It also represents eight Vasus. Nine-faced: It represents Durga and her various forms (Navashaktis) and removes fear of death. Ten-faced: It represents Ten Yamas and a devotee achieves peace of mind. Eleven-faced: It represents the eleven forms of Rudra (Shiva). Twelve-faced: It represents Lord Vishnu and twelve Adityas and a devotee wearing it attains moksha. Thirteen-faced: It represents ‘Kama’ (the god of love). Fourteen-faced: It represents Rudra when he created the Rudraksha out of his eyes.